Red Goddess has come a long way since we first featured the game here on 1800Pocket/PC. The latest trailer shows the introduction of the game as well as some content that’s been added since the last Red Goddess trailer was released. 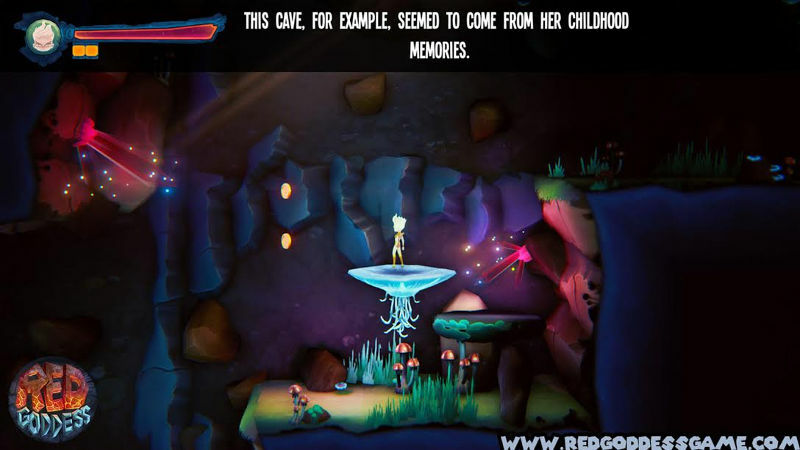 “Red Goddess: Inner World” is a platform game, nonlinear, with open world combat situations and adventure, with the aim of exploring the world of the subconscious of the protagonist “Divine”, a young goddess who is losing his powers and decides to travel to this planet, which is your subconscious, to discover that the lost and recovered. The player will have to explore the world and find the Divine memories to know that is what is destroying it, and knowing that is losing its powers. The journey begins when Divine enters the world of his subconscious and crosses mountains, villages, caves, finding its way many unknown dangers. The player must combine different abilities, fights, platforms … to fight their enemies. Divine, the heroine of our game is aided by two alternate personalities Rage and Fear, which represent their main emotions: anger and fear. In his mind negative thoughts, they will be personified as enemies they will have to fight and win to move forward and achieve its objective. Explore a mysterious planet dominated by the subconscious mind of the main character. The narrator is a character who will guide the player, is mysterious and dangerous, knows the secret of Divine. Your other half represented in a mask, use the mechanics called “the ray of madness”: you can select only “half” of the protagonist (either anger or fear), the other half is inactive and appears as a mask . Once the alarm “ray of madness” activates the mask will turn against you. Unlock spectacular powers as double jump, fly, and telekinesis. The player will have to find and collect coins depicting his memory to unlock new skills and enter new areas. To hold and move items on the planet to discover the mysteries of the past of the main character. Possibility to switch to one of three characters: Divine, Fear and Rage. What do you think of the game so far and the announcement that it will be delayed? Post your thoughts in the comments below.